This artfully styled basket of colorful flowers sure has a lot of pizazz! Its a perfectly stylish way to express your thoughts about someone special. 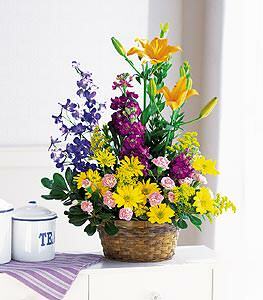 Carnations, daisies, stock, delphinium and lilies arranged garden-style in a natural woven basket.